To celebrate the forming of the Bishop Wheeler Catholic Academy Trust, representatives from six Catholic schools celebrated the Inaugural Mass of Dedication, held at St. Anne’s Cathedral in Leeds. Over 300 students from St. Mary’s Menston, St. Joseph’s Otley, Ss Peter and Paul Yeadon, Sacred Heart Ilkley, St. Mary’s Horsforth and St. Joseph’s Pudsey participated in the Mass. Many staff, both past and present, Trust and Academy Governors, guests from the Diocese of Leeds, local councillors, and parents attended. 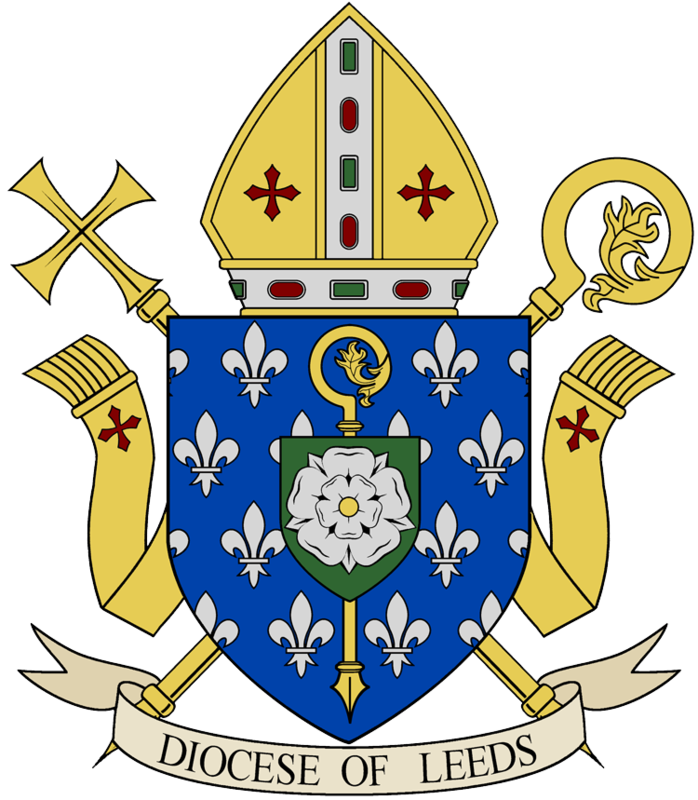 The theme for the mass was “In Truth and Love” which is the motto contained on the Bishop Wheeler Episcopal Coat of Arms. The Mass was presided over by Mgr John Wilson, the Diocesan Administrator and the following concelebrated: Mgr Michael McQuinn, Mgr Kieran Heskin, Canon Lawrie Hulme, Mgr Paul Owens, Fr Anthony Jackson, Mgr Billy Steele, and Fr Malachy Larkin. 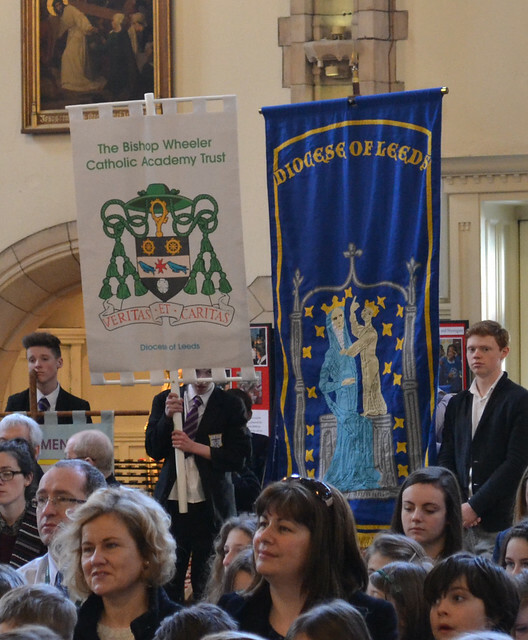 The Mass commenced with an entrance procession of the school banners carried by representatives from each of the six schools involved, behind the new Trust Banner and the Diocese of Leeds banner. In the homily Mgr John Wilson used the family of Mr Men and Little Miss books to highlight that we are all different, but we all belong to the same Trust family. Mgr Wilson displayed the Wheeler Trust plaque which was situated above the Cathedra, the Bishop’s Chair in the cathedral Wheeler during his episcopacy from 1966 to 1985. The celebration of the newly founded Bishop Wheeler Catholic Academy Trust was symbolised by the lighting of the Trust Candle. Bidding Prayers were read by representatives from the Trust Primary Schools: the prayers enforced the mission of the Trust to work together in truth and love to provide the best possible opportunities for all our young people and their families. The Trust’s mission is the provision, development and future safeguarding of a World Class Catholic Education where every child, member of staff and family matters. The schools, their governors and the trust directors work together, based on the principle of subsidiarity, in faithfulness and humility, to provide an education where Christ and His values of respect, service, tolerance, dignity and forgiveness are at the heart of everything we do. • Let us pray for Pope Francis and all those entrusted with the leadership of the Church, on whom we rely so heavily: that they may be fearless and rock-like in proclaiming Christ’s message of hope, truth and love for all; and that, through the working of the Holy Spirit, they will be granted the courage and wisdom always to lead in faith and serve in love the flock that has been entrusted to their care, and in turn guide us to bring the Good News to everyone we meet. • Let us pray for world leaders: that their decisions may reflect the wisdom and loving care of Jesus, the Good Shepherd, and that, in seeking the welfare of all the peoples of the Earth, they act justly, truthfully, peacefully and with compassion, never forgetting our responsibility to be good stewards of the Earth’s God-given resources which must be shared fairly. • Let us pray for everyone in the world who doesn’t have enough to eat today; for those whose lives have been torn apart by war and violence; for those who do not have the chance to go to school; for those who suffer through untruth or lack of love; and for everyone who is trying to help them in any way. May our world reflect more and more God’s Kingdom Values of Love, Truth, Justice, Peace and Reconciliation. • Let us pray for anyone we know who would appreciate a prayer today; for those who are ill and for those who worry about and care for them; for those who are lonely or who have many problems; for those who are sad because someone they love has died and for those without faith, hope or love. May we always do what Jesus told us and show our love for our neighbour in the way we live our lives, remembering that our actions speak louder than our words. • Let us pray for all the schools that comprise The Bishop Wheeler Catholic Academy Trust: for our children, teachers, governors and all those who contribute in any way to the success of what we seek to achieve. We remember especially all our Year 3 children who have begun preparing to make their First Holy Communion and our Year 9 pupils who are preparing to receive the Sacrament of Confirmation later this year. • Let us pray that we may grow ever closer as a community that has Christ at its centre, and that each of us uses our unique gifts and talents so that together we encourage and support each other to live lives that measure up to the standard that Jesus set for his followers. May the Holy Spirit guide us to recognise the worth and value of each individual, and always to seek the truth, no matter how hard or difficult, in a spirit of love and compassion for our neighbour. Let us pray that all with whom we work, and all those whom we meet, may see in us the reflection of the master, whose we are, and whom we seek to serve. On behalf of the school communities of The Bishop Wheeler Catholic Academy Trust, St. Mary’s, Menston, promises to put love and service of others at the heart of everything we do, (remembering always Your commandment to love our neighbour as we loved ourselves). On behalf of the school communities of The Bishop Wheeler Catholic Academy Trust, Sacred Heart, Ilkley, promises to deal with other with truthfulness and integrity, however difficult that may be, (remembering always that God is the source of all truth and that You were the way to the Father). On behalf of the school communities of The Bishop Wheeler Catholic Academy Trust, St. Joseph’s, Otley, promises to deal with others fairly and justly, and to speak out against injustice in our world, (remembering always that You stood up for those least able to help themselves when You were on Earth). On behalf of the school communities of The Bishop Wheeler Catholic Academy Trust, St. Joseph’s, Pudsey, promises to deal with others peacefully and with good will, and to work for peace in our world, (remembering always that the peace that You give to us is beyond the world’s understanding). On behalf of the school communities of The Bishop Wheeler Catholic Academy Trust, St. Mary’s, Horsforth, promises to offer to and to seek from others forgiveness and reconciliation, without holding grudges, (remembering always that only then can we expect forgiveness for ourselves from God). On behalf of the school communities of The Bishop Wheeler Catholic Academy Trust, Ss Peter and Paul, Yeadon, promises to show respect through word and deed for every person that we meet, (remembering always that all human beings are equal in Your sight, and that You have no favourites). Music for the Mass was provided by an orchestra and choir made up of students from all the Trust schools, ably led by Mrs Chapman, music teacher at St. Mary’s, Menston. Following Mass, guests gathered, very appropriately, in Wheeler Hall for refreshments. The Bishop Wheeler Catholic Academy Trust Inaugural Mass witnessed and blessed the commitment of the six schools to work together ‘in love and truth’ and to put Christ at the centre of all that they do. The Mass consolidates this commitment to the Catholic Church and in Catholic education and heralds the first of many collaborative celebrations and events.